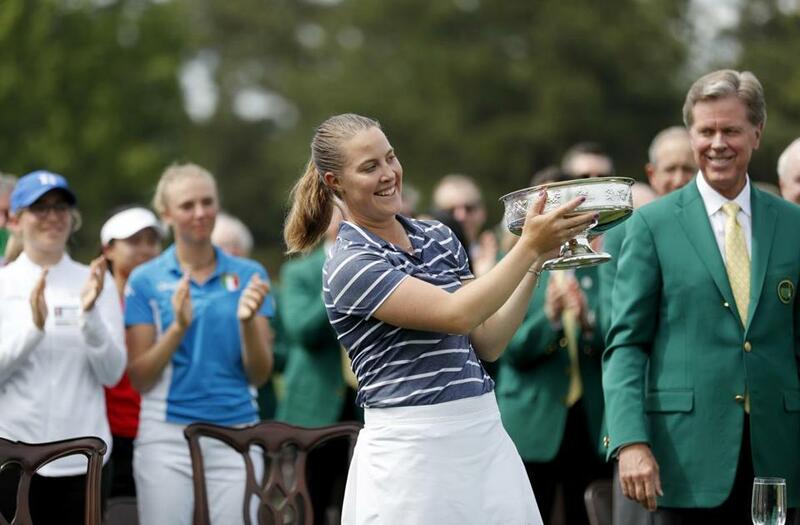 Jennifer Kupcho holds the trophy after winning the Augusta National Women&apos;s Amateur golf tournament in Augusta, Ga.
AUGUSTA, Ga. — Augusta National sure is enjoying this victory lap. Maybe you think they deserve it. And maybe, to a degree, I agree. But still, it feels awfully self-congratulatory for this longtime exclusionary golf club to revel in the role of pioneer, when it was their practices (and those like them) that created the need for pioneers in the first place, keeping women out of the highest echelons of golf for as long as they did. Yet here we were Wednesday, in session for the club chairman’s annual media address, feeling as if we had walked in on a green-jacketed happy hour. After years of rancor and criticism for not having women members, after years of answering questions about why their stated “grow the game” efforts did not include women, these heady days since hosting the final round of the inaugural Augusta National Women’s Amateur left the arms of those in the green jackets as tired as if they had swung the clubs themselves, so busy as they were patting each other on the back. “Thanks to our valuable partners, and with the enthusiastic support of our membership and our exceptional staff, we believe we have created a platform that not only will increase interest in this important segment of our sport, but in a larger sense, will shine a bright light on the amazing accomplishments of women everywhere,” current chairman Fred Ridley said. Too bad it was Augusta that kept women in the dark for so long, not admitting a female member until 2012. You know what I’m proud of Mr. Chairman (as too many of the media members in attendance make a point of saying reverentially before each question)? All the things women have been doing in the world for all time. Welcome aboard. We’ve been here all along. So here it is: Thank you, Augusta, for adding the amateur event. It’s utterly fantastic to see these emerging golf stars get a chance to compete on one of the world’s most beautiful, iconic, and challenging golf courses. It’s undeniably important for young aspiring golfers to see those emerging stars, such as Jennifer Kupcho, the Wake Forest senior who won the event, and imagine themselves one day doing the same thing. Representation matters. Ask the men. “When I was a kid, I would dream of playing in the Masters, and I watched Seve [Ballesteros] win and I would dream of that, and it gave me something to work towards, to dream about during my practice sessions,” three-time Masters champion Phil Mickelson said earlier this week. “It’s a big thing when you’re young to have dreams like that, and to have the opportunity to play here and compete in the Drive, Chip & Putt Championship or to play in a Women’s Amateur event here, or any event here, gives you something to aspire to. But here it also is: Don’t stop here, Augusta. Don’t get so wrapped up in the reveling that you can’t see the opportunity in front of you, the chance to include women in even more meaningful ways, to make it clear you believe the future of a game struggling to maintain its niche in a crowded sports world can find strength in the increased inclusion and celebration of women. Maybe it’s by increasing the size of the amateur event, and holding more than just the final round on Augusta National’s magical greens. (The first two rounds of the event were played at the Champions Retreat, a 27-hole private golf club near Augusta.) Maybe it’s by partnering with the LPGA and hosting an actual women’s professional Masters, a logistical challenge for sure but an incredibly exciting idea nonetheless. Or maybe it’s something even smaller yet more symbolic, like inviting some LPGA stars to participate in the annual par-3 tournament on Wednesday of Masters week. Use your platform to do as much as you can to fulfill the challenge you posed to others. Good, but late. Good, but long overdue. Good, but in the world today, still not enough. It is OK for women to be grateful, yet still be annoyed it took so darn long. It is OK for women to appreciate this, yet still want more. But here’s an idea, Augusta: Let’s keep on walking.